Manchester City star, Kevin de Bruyne reveals that he supported Liverpool during his childhood and Michael Owen was his idol. 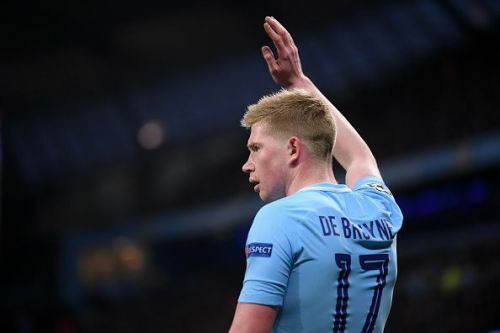 Kevin de Bruyne is among the most talented players of his generation and he was the mastermind behind Manchester City's incredible run in the Premier League last season. The 26-year-old won the Manchester City Player of the Season accolade last campaign and he also provided the most number of assists during the FIFA World Cup 2018. However, he has been unlucky with injuries this season and managed to appear in just 14 league games thus far. Speaking to Match of the Day Magazine(via Goal), Kevin de Bruyne reveals that he comes from the family of Liverpool supporters. "I was a Liverpool fan. My family that lives in England were all Liverpool supporters so I was, too,". "I loved Michael Owen, because I was really small like him and quick, too. I compared myself to him at the time. I liked [Zinedine] Zidane and Ronaldinho too – those really skillful players. He also revealed that it would be incredible if Manchester City could lift the Champions League. "I don’t really have dreams anymore – I’m living the dream. I want to win as much as possible and have good moments,". "We’ve won the Premier League and some other cups, but if you win the Champions League it really gives you something extra. To say, ‘I won the Champions League’ would be incredible." Manchester City are scheduled to play Swansea City in the FA Cup Quarter-finals next before facing Fulham in the league on March 30. Kevin de Bruyne is likely to miss both the games due to injury. Liverpool vs Manchester City: The next big rivalry in English football?